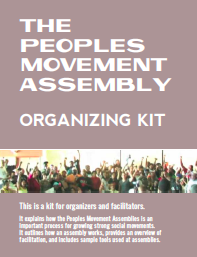 A lot of organizing happens before the assembly begins. A strong collaborative team and engaged anchor organization(s) are important. Be aware of power dynamics around race, class, gender, age, sexuality, different abilities, etc. Maintain momentum by ensuring that participants have clear ways to continue to be actively involved. For more information on how to planning BEFORE, DURING, and AFTER your PMA follow the links below.